This pie was a signature recipe of my Grandmother Maria, today would be her birthday , so I decided to bake this pie for the first time in my life. I ate it hundreds of times, but never thought that this deliciousness is so simple to cook. 1. 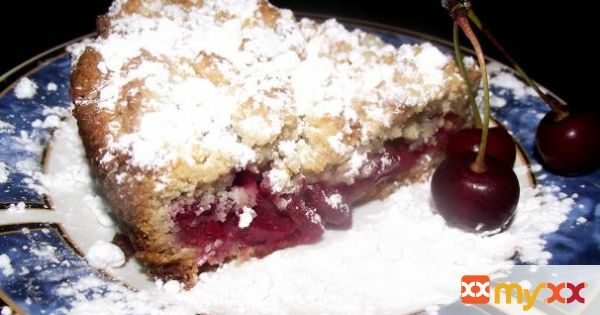 I was baking this pie with cherries, so in my execution it’s sweet and sour shredded pie. 2. Sift flour, add 1 cup of sugar and 1 teaspoon of baking powder, mix everything very well. 3. Shred the butter and mix it with the flour-sugar-baking powder. 4. In a separate bowl mix: egg yolk, 2 tablespoons of water, 1 tablespoon of sour cream (or mayo), add vanilla extract. 5. Form a batter, split the batter in proportion 2/3 and 1/3. 6. Put it in a fridge for 15-20 mins. 8. Filling: take the filling you are planning to use, I’m using cherries, spread over the batter and shred the1/3 of batter over the filling. (So your pie would look like a curly pie). 9. Bake the pie for 20-25 mins untli the crust is golden brown.